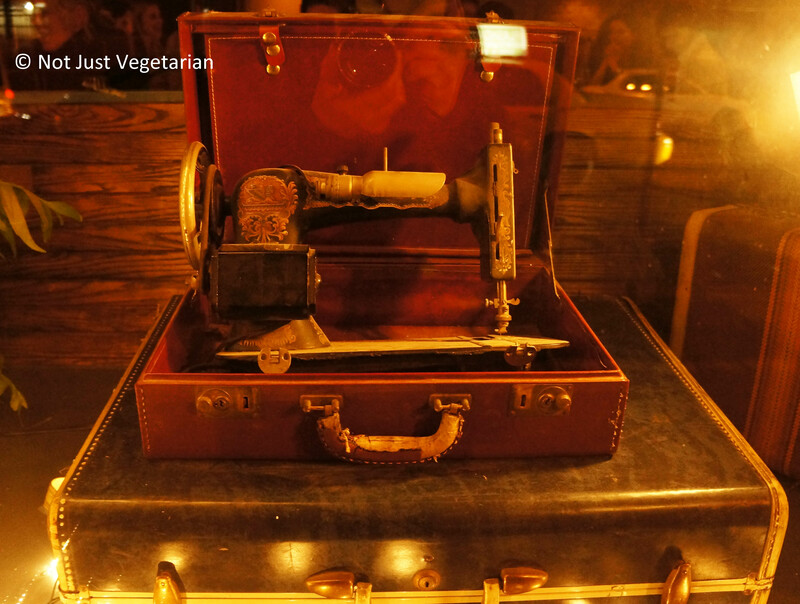 It seems weird to write about my not-so-great experience at Barraca within a week or two after the NY Times’ Ligaya Mishan wrote positively about the same place – she says “the food is straightforwardly delicious”. 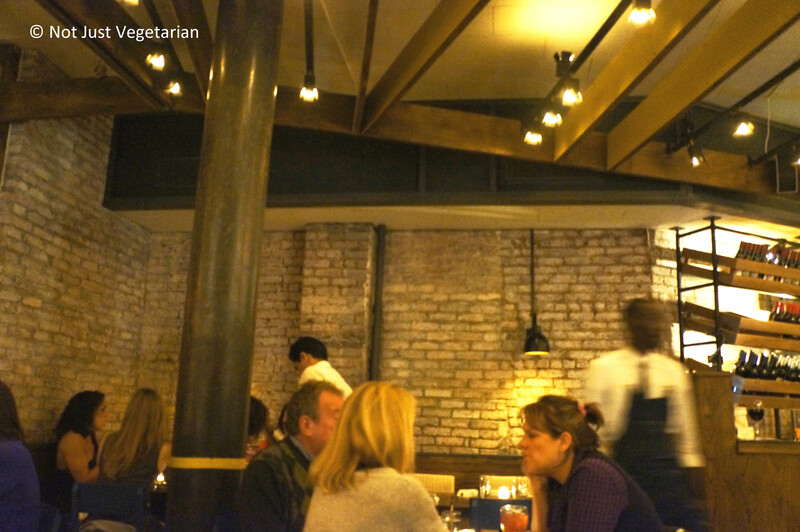 Barraca is a tapas restaurant by chef Jesus Nunez, who was earlier at Gastroarte on the UWS – some of you may remember that I had an unforgettable meal there (see this post). I had a very different experience from Ligaya Mishan and I suspect it’s because her write-up was based on dishes that we did not order, and we did not get the dishes that she recommends in her review. 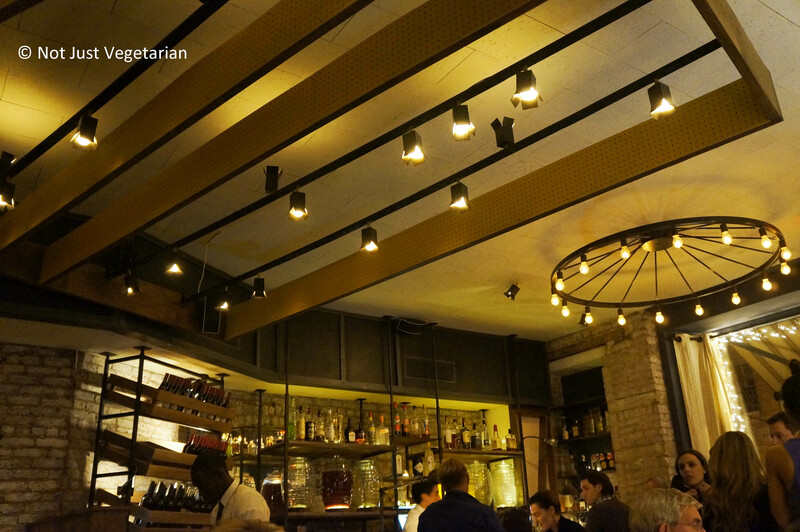 I had high expectations from Barraca, given my positive experience at Gastroarte. We did not have trouble getting a reservation and we wanted a quick bite before heading out for a movie in the neighborhood. The floor in the bar area reminds me so much of a classic tapas / neighborhood joint in Barcelona (sorry, I have no pictures of either!). I loved the feel of the place as soon as I entered. 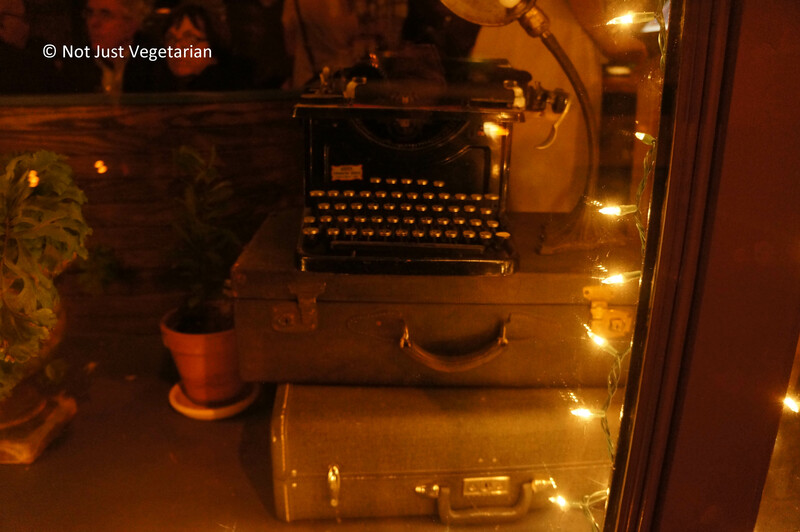 The window displays of old leather suitcases, typewriters, sewing machines etc. remind me of the exhibits in the Ellis Island Immigrant Museum (depicting what the immigrants brought with them when they arrived at Ellis Island), from almost a century ago. We had the pear salad, the clams with salsa verde, the grilled cuttlefish, and mushrooms sauteed with garlic, along with a glass of red wine. Most Tapas restaurants in NYC seem to have only 2 options for Sangria. Barraca, however, had 5 different sangrias, with names of different regions of Spain (La Mancha, Rioja, Compostela, Penedes, and Valencia) and unique combinations of fruit and alcohol – e.g., Valencia has grapefruit juice, ginger, citrus oil, and vodka, while Penedes has cava, peaches and lavender. Barraca also offers some beer. I was intrigued by a beer titled “Inedit by Ferran Adria” (of el Bulli fame), which was listed at $26. It was not sangria weather or beer weather that evening, so I decided to go with a glass of red wine. It was listed as a robust / spicy wine from the Emporda region, called Turo Negre. It was smooth, not acidic or too sweet and easy to drink. Something that I hope to remember to order again, in Baracca or elsewhere. I love the fact that the wine list is classified as mild / robust /spicy etc. 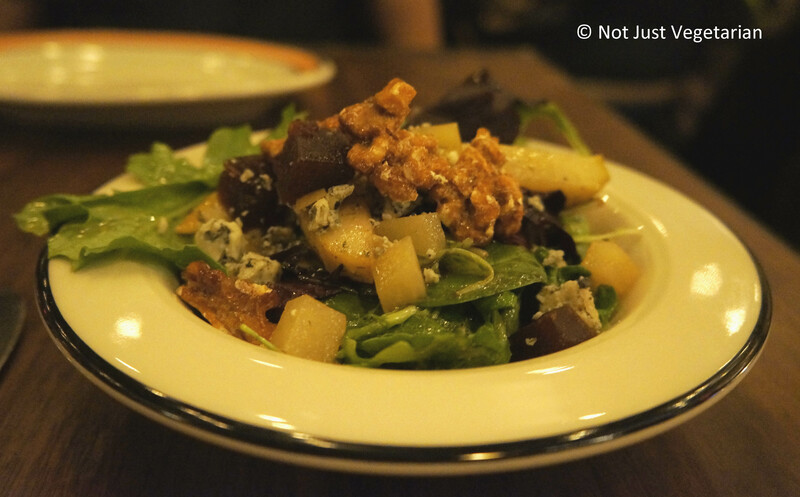 The pear salad was very much like the pear salad we had at GastroArte, which I loved (the restaurant and the salad). This time, however, I was quite disappointed with the salad. The salad was small in its portion size, not that I have a problem with that. I felt that it had too much dressing (i.e., too acidic), too many leaves, and had 3 pieces of toasted walnuts, 2 small cubes of quince, and a 3 – 4 tiny pieces of valdeon cheese (yes, I counted these). There was potential in the salad, but felt more like a side of greens with too little of quince, cheese and walnuts. The grilled cuttlefish seemed exciting on paper with its kale, parsley ali-oli and preserved lemon. This dish was a let-down. The grilled cuttlefish was warm alright, but the pieces were leathery, chewy and bland. The kale and the acidic preserved lemon resurrected the dish in my opinion. I could hardly taste the parsley ali-oli. Overall, not a bad dish, but the cuttlefish could have tasted better – not sure how, I am neither a cuttle fish expert, nor a chef. 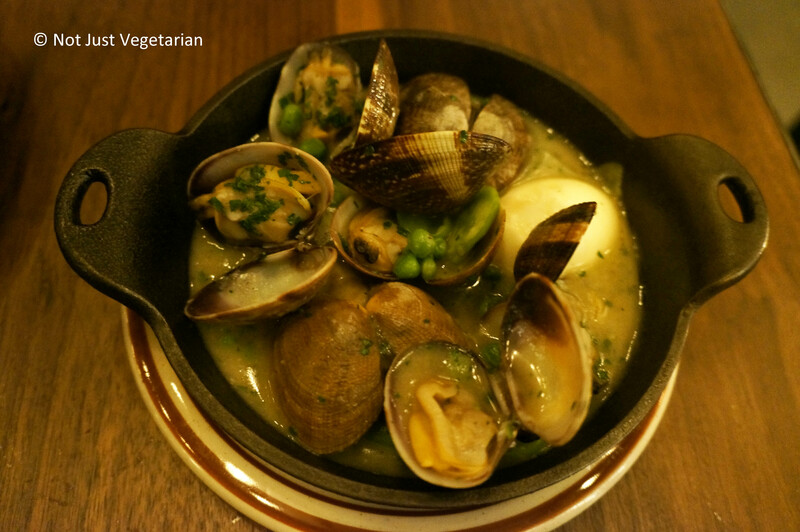 The clams in salsa verde were simply delicious. I am not sure what ingredients make a Spanish salsa verde, but the salsa verde in this dish felt like a combination of white wine and parsley, not that it these short-changed the dish or anything. The fresh, crunchy, asparagus and the soft English peas were a nice addition – they both brought a rich flavor and a beautiful green color to this dish. The clams in their shells were cooked perfectly. The sauteed mushrooms were terrific with brown roasted garlic, and olive oil and had some paprika or something that added an ever-so-slight kick to the mushrooms. This dish was a perfect accompaniment to the clams. 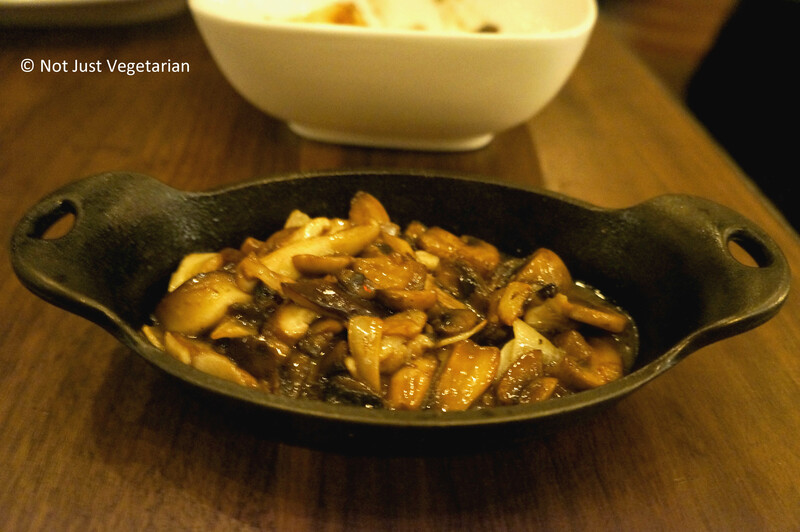 Overall, while the cuttlefish and the salad did not meet my expectations, the clams and the mushrooms were delicious. 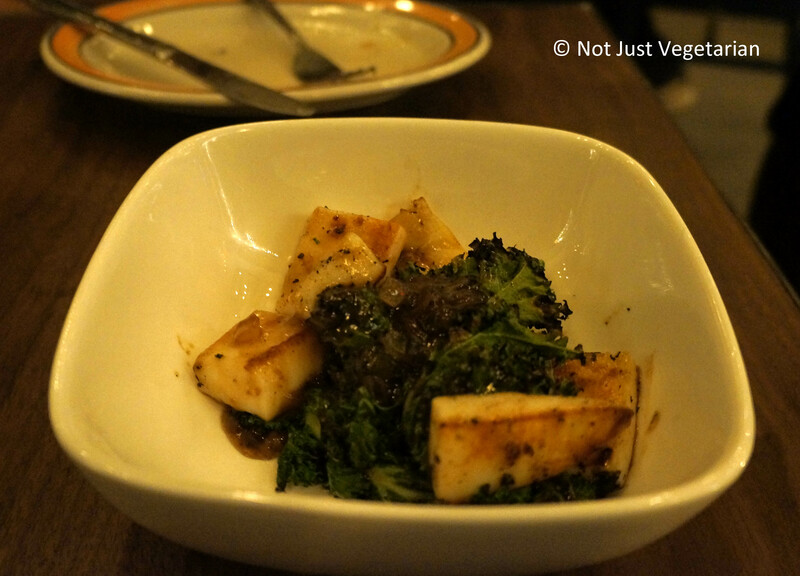 Barraca offers many other vegetarian options too, which I did not try. There was also a seafood paella with black rice (so I can compare it with the one that I had at Soccarat – Chelsea). So, perhaps its worth going to again given the potential for a great experience. Why would you go to Barraca? would love to try the sangrias one of these days…ramesh. Yes, Ramesh, the Sangrias have very different but appealing ingredients. Have to go back to try them.